This window shows you the details of your installed license. It also shows you the number of days you have used ShellDispenser. You can click the link if you want to buy additional licenses or if you want to manage your license at our web site. The "My license details" window will be shown when you select the "Help \ My license details..." menu item in the main window. The name the installed license is issued to. The number of users the installed license is issued to. The number of the installed license. The e-mail address that was used to purchase the installed license. Starts your web browser and opens the ShellDispenser web shop. 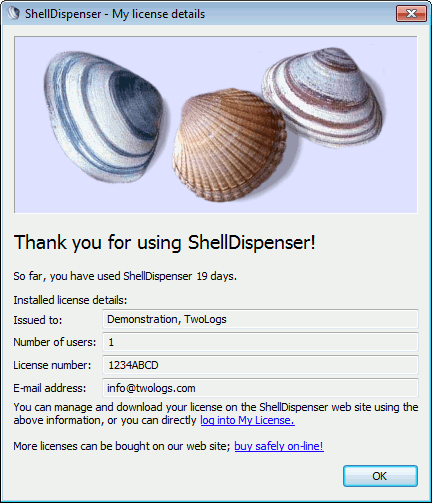 Link "log into My License"
Starts your web browser and opens the My License page on the ShellDispenser web site. Show the "My license details" window help page.